The Power of a Turbo-Charged Sale on Your Desktop! Planning your "sell home fast" sale can be very overwhelming. With so many details to plan and things to do, it's sometimes hard to know where to begin or what to do next! The Comprehensive 5 Day Sale Control Panel is mission control for your sale. It offers instruction with both simple and complicated aspects of the sale, gives you a complete record of all the materials you need, and keeps your "sell home fast" sale on track—working almost as a digital consultant. You'll have complete, online access to the entire 5 Day Sale Sell Home Fast database of professionally developed and proven-to-work documents. With your personalized username and password, you'll be able to login during the weeks before and after your sale and get virtual coaching with thorough "How To" guides, tested phone scripts and templates, and a full range of extensive bidding materials. This system also comes with an all-inclusive, smart-technology checklist, generated specifically for your sale date. You'll get an interactive list of all the tasks you need to do on a day-to-day basis, so you can make sure your sale is on track to sell home fast from Day 1 to the Close and everyday in between. A Completely user-friendly interface for instant, easy access to all your files. Newspaper ad tips — print the ad that will get the most calls for your money. A PDF that teaches you how to answer your live phone calls generated through your marketing efforts, with the tips to getting callers to the open house. A PDF instructional guide on how to encourage bidders to place their initial bid and how to keep the bidding sheet piling up with starting bids! Sell Home Fast Open House Placards so buyers know what to review and pick-up such as, a Bidding Sheet, Covenants and Restrictions Sheet, Full Inspection report sheet, Guest registration, Master Brochure sheet and much more. Adds a professional look to sale, and also lets you know exactly what you need to display and handout during the open house. A full regiment of important handouts for your open house such as a "Disclosure Statement", a "How to Bid" handout and much more. Allows seamless and "live" editing of your Website B Package. Templates for flyers to distribute in your community and increase your visitors during the open house. Many extensive "How To" guides to the entire round robin bidding process from start to finish, and what to say and do to keep the bidding going strong during those crucial moments. Detailed bidding and phone scripts, so you'll never be tongue tied or worried about what to say. Includes the Complete Real Estate "Indoor" Sign Kit, and guides to outdoor sign placement. An interactive 5 Day Sale sell home fast checklist that's customized to your sale date and runs you through all the day-to-day steps you need to get your sale done right. A buyers duties sheet, letting your buyer know exactly what steps they need to take when the home is awarded to them. Eliminates any buyer confusion during the actual purchasing process. One of the key advantages to using a Control Panel is that it gives you total editing power over a 5 Day Sale Website B package! When used together, your Control Panel and Website Package B create a seamless marketing cycle that gives you total control over what information you send over the Internet. Make adjustments to your Website Package B anytime of the day or night, even moments up to your Open House! 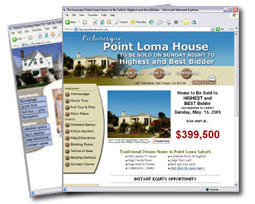 Buy a Control Panel and combine it with a Custom 5 Day Website Package "B" for seamless home sale editing capabilities.